The British landscape artist and printmaker, Rigby Graham grew up in Leicester attending the city's College of Art and Design in 1949. Throughout his career he travelled widely, capturing the spirit of a place through his painting and printmaking. His desire to travel developed young, visiting France, Switzerland and then Ireland when only sixteen. 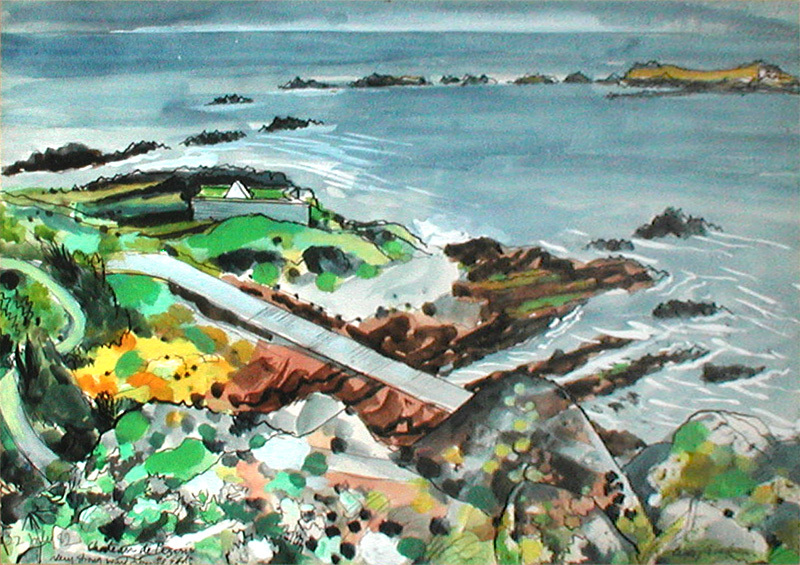 In the mid-1950s he visited the Bailiwick and this painting of Chateau de Pezeries painted in 1982 shows that these islands were a draw long after that initial visit. It was in the late 1950s that Graham began to be interested in printing and graphic design, teaching in the Printing School of Leicester College of Art. He found success as an illustrator, creating illustrations for publications such as Rilke's Sonnets to Orpheus. Graham's ability to turn his hand to various artistic genres and mediums continued to develop and while visiting Sicily began work as a muralist. During the 1960s and 1970s most of his work focused on book illustrations. 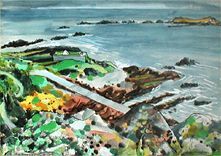 He did continue to paint however, basing himself for short periods in Corsica, Crete and Ireland. Islands, large and small attracted Graham, the coastline and the unique quality of each one providing ever-changing visual possibilities.